The National Marine Fisheries Service ordered gillnetters and lobstermen to remove their gear from a 1,700 square mile area off of Cape Ann in late April and early May. The closure was the first test of the controversial Dynamic Area Management (DAM) Plan aimed at protecting endangered right whales from entanglement in fishing gear. On April 14th, a spotter plane counted eight right whales in a small area about 25 miles east of Cape Ann, triggering the action. Under the DAM rule, which is part of the fisheries service whale protection plan, the agency must close or require gear modifications in an area when three or more right whales are seen within a 75 square mile radius. Just 300 North Atlantic right whales remain, and scientists warn that deaths due to ship strikes and entanglement are contributing to their decline. At least two right whales have died in the last five years after being entangled in fishing gear, and 10 others have disappeared after entanglements. On April 19th, David Gouveia, marine mammal coordinator for the Northeast Region, sent an e-mail to "interested parties" with advance notice of the DAM closure, but most fishermen learned about it when they received a letter dated April 25th. The order was published in the Federal Register on April 26th and the closure took effect on April 28th. This gave fishermen two days to remove their gear. Mary Colligan, NMFS Assistant Regional Administrator for Protected Species, says three whales were in the area when the closure went into effect on April 28th. The closure ended on May 13th. Ron Hemeon is an Essex lobsterman who had 800 traps set in the DAM area. He received official notice of the closure just two days before he was to have his traps out of the area. Hemeon moved a handful of traps to the outer edge of the closed area, but could do little more to comply with the order. "I didn’t really do much about it because there wasn’t too much I could do," he says. "It took a month to get the gear set up out there in the winter." According to Hemeon, other fishermen were also in the same predicament. "I had to travel through the area almost every day during those two weeks," he says, "and I didn’t see a lot of gear being moved." The Coast Guard was charged with enforcement of the DAM, but Hemeon says when he saw Coast Guard officials in the area during the closure, he was not approached. The fisheries service implemented the DAM plan in January, in spite of opposition from fishermen, scientists, environmentalists, and state fisheries regulators. NMFS was under court order to implement a right whale protection plan after settling lawsuits brought against the agency last year by the Humane Society of the U.S. and the Conservation Law Foundation. NMFS officials insist that, although the DAM model is not perfect, it is an effective management strategy. "I do think it’s effective," Colligan says. "The limitations are in that it’s a reactive process. We understood the limitations, but it’s just one tool in the toolbox." 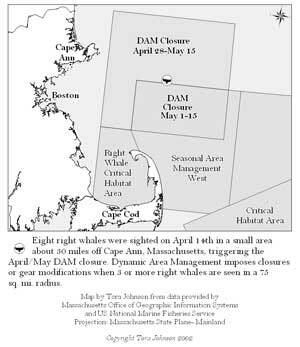 In addition to the DAM rule, the current right whale protection plan includes gear modification requirements, Critical Habitat Areas, and Seasonal Area Management Areas (SAMs), areas where whales go more frequently and additional closures and gear modifications are required. Colligan says DAMs allow the fisheries service to protect whales outside the SAMs and Critical Habitat Areas. However, nearly everyone involved in the process charges that the DAM rule is unworkable and endangers both whales and fishermen. "It’s just impossible in so many ways to expect people to move in two days, Hemeon says. "And they’re not even giving the other rules a chance to work." He has complied with the new whale-friendly gear requirements by investing in sinking groundline, weak links and lighter buoy lines. In addition he is using longer trawls to minimize the number of vertical lines in the water. Bill Adler, Executive Director of the Massachusetts Lobstermen’s Association, says that because the order came early in the season, only a couple dozen lobstermen had gear in the area when the DAM closure was announced, and most of these were only fishing four or five hundred traps, but even so, few fishermen could comply with the closure. "The fishermen don’t like to be illegal," Adler says, "but nobody could get all their gear out in time." Scientists also criticize the plan, saying right whales can swim more than fifty miles in a day as they wander in search of plankton patches to feed on. So the whales that trigger a DAM closure could be hundreds of miles away by the time the closure goes into effect two weeks later. In addition, the most efficient way for fishermen to comply with the DAM rule is to move the gear just outside the closed area, leaving a "fence" of vertical lines for animals moving from the area, increasing the risk of entanglement. Lobstermen and gillnetters, the groups most impacted by whale regulations, are frustrated with the whale protection process, saying that ineffective rules like DAM destroy trust and leave the fisheries open to additional regulations or closures if whales continue to die from entanglement. Many are pushing for coast-wide, year-round gear modifications to protect whales wherever they are and to put an end to complex regulations and dynamic area closures, a move both Adler and Hemeon say they would support. Fishermen also charge that the federal government is placing more of the burden for whale protection on the backs of fishermen, while the shipping industry has been subject to very little regulation to prevent ship strikes. As of this writing, fifty right whales are feeding in the Great South Channel Critical Habitat Area and may spread out from there if plankton concentrations change as the season progresses.